AppMetrica Push Unity is a plugin for the Unity3d game platform that includes support for the AppMetrica Push SDK for the Android and iOS platforms. Before using the AppMetrica Push Unity plugin, you need to enable and initialize the AppMetrica Unity plugin version 3.0.0 or later. Attention. To update the plugin, delete the Assets/AppMetricaPush directory and import the new plugin version (pay attention to the Android configuration). Step 1. 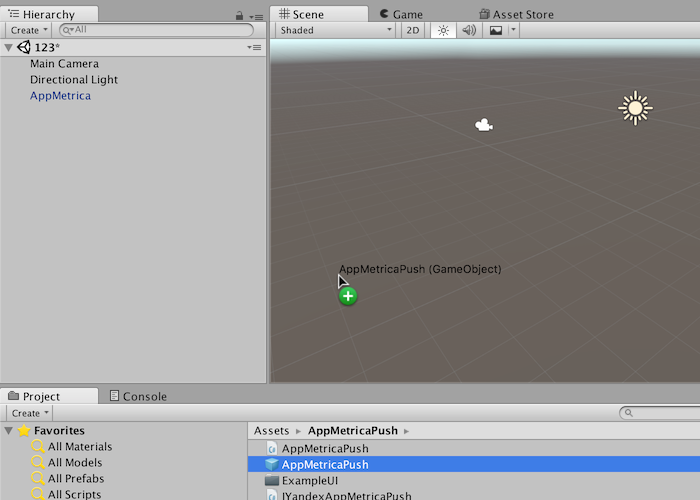 Download the AppMetrica Push Unity plugin. Step 2. 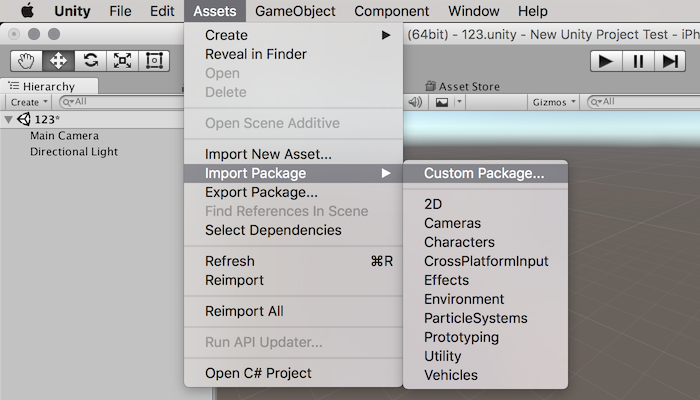 Add the plugin to the project — open the project in Unity Editor and import the AppMetricaPush.unitypackage plugin (Assets → Import Package → Custom Package). Step 3. Open the Assets/AppMetricaPush/ folder and drag the AppMetrica prefab to the project's main stage. If the plugin is integrated this way, the AppMetricaPush script on the added prefab automatically initializes the AppMetrica Push SDK. The added AppMetricaPush prefab is a singleton. It isn't deleted when switching to a new Unity stage, and it deletes other objects that the AppMetricaPush script is installed on. Tip. You can add a new script (Add Component → New Script) to the existing AppMetricaPush prefab and add code to implement the Start() method for the script. Note. The AppMetrica Push Unity Plugin uses “swizzling”: it intercepts the execution of certain methods of the UnityAppController class by using the ObjectiveC runtime. The code is in the AppMetricaPush/Plugins/iOS/YMPBridge.m file. APP_ID — ID of the app in Firebase. You can find it in the Firebase console: go to the Project settings. In the Your application section copy the value of the application ID field. SENDER_ID — The unique ID of the sender in Firebase. You can find it in the Firebase console: go to Project settings → Cloud Messaging and copy the value of the Sender ID field. API_KEY — App key in Firebase. You can find it in the current_key field of the google-service.json file. You can download the file in the Firebase console. Note. If you use the AppMetrica Push SDK integration sample, change the package attribute value in the manifest element to the package id of your application. There is an example of the file in the Assets/AppMetricaPush/Plugins/Android/ directory (AndroidManifest.xml).